Short was not tall, standing 5-foot-9 and listed at 170 pounds. He completed one year at Orange County Community College. Short worked his way up the ladder of minor-league ball. His first season was a partial one, after graduating high school in 1955, pitching for the Bristol Twins in the Class-D Appy League in the twin cities that spanned the Tennessee/Virginia border. In 13 appearances, he was 2-3. In 1956 he was advanced to Class C and started 23 games for the Monroe (Louisiana) Sports in the Evangeline League. He was 9-11 with a 3.40 ERA. He split the 1957 season between the Class-B Peoria Chiefs and the Class-A Binghamton Triplets. All but four innings over three games had been with Peoria, where he was 7-5 (3.22), having lowered his earned run average for the third consecutive year while each time pitching at a higher level. In 1958, Short was 7-6 (3.34) in a full season for Binghamton. He married Dorothy M. Luczyeki in January 1959, then had something of a breakout season, joining the New York Yankees in spring training and pitching the full year at Triple A for the Richmond Virginians. He worked 178 innings, started 26 of his 27 games, and was 17-6 with an ERA of 2.48. He struck out 133 and walked 62 with a WHIP of 1.146. There had even been some talk in the press of Short becoming a new Whitey Ford, to whom he bore something of a resemblance.5 He was named an All-Star and also the International League MVP. In late May and early June, however, he suffered a strained elbow and was thrown for three losses in a row. He was sent down to Richmond where he was 3-1. Recalled to New York in time to start the first game of a doubleheader on July 31, he worked three more starts, winning one and losing one before being returned to Richmond once again. Over his stints in Richmond, he was 6-2 (2.28). By season’s end, he was 3-5 (4.79) with the big-league club. He did not take part in the World Series against the Pirates. In 1961 he joined the Yankees for advance spring training, but it was back to Richmond for the full season. He was placed on the disabled list with a sore elbow even before the season began, had an operation to remove bone chips and bone spurs, and was not activated until late July. He only got into 13 games, eight of them starts. He was 1-1, 3.21. Short made it back to the majors in 1962, but this time he was pitching for Baltimore. He’d been selected by the Orioles and taken from the Yankees in the Rule 5 draft on November 21, 1961. He was in the Orioles system for the next 4 ½ years. In 1962 his only major-league action was four innings in five early-season appearances, with no decisions and a 15.75 ERA that indicated he might benefit from further development in the minors. Baltimore’s Triple-A club was the Rochester Red Wings and he spent four seasons there. 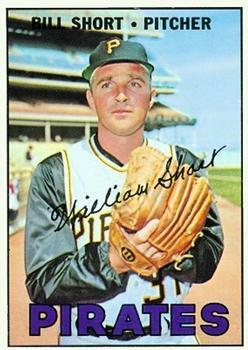 In 1962, Short only worked 65 innings (3-4, 4.29), with arm issues (and apparently confidence issues) at play.9 But the next three seasons saw him healthy and they were full ones, Short working mostly as a starter: 1963 (13-8, 3.38), 1964 (8-11, 3.39), and 1965 (13-4, 2.92). A strong start in 1966 – again with the Red Wings, for whom he was 8-5, 2.78 – resulted in Short being called up by the Orioles. One of the losses came on May 10, when he threw a one-hitter (a leadoff home run by Mike Hegan on Short’s second pitch), but lost, 1-0. In his first major-league start since 1962, on July 1 he threw a six-hit shutout against the Minnesota Twins. After six starts, he had a 2.87 ERA despite a 2-3 record, and the Boston Red Sox purchased his contract from the Orioles on August 15 for the $20,000 waiver price.10 He’d finally made the team he cheered for as a kid. For the Red Sox, he worked only in relief, 8 1/3 innings spread over 10 appearances with a 4.32 ERA and no decisions. On October 17 the Red Sox sold his contract outright to the Columbus farm club of the Pittsburgh Pirates and Short moved to the National League. Short’s 1967 season started much as had 1966, with the big-league club out of spring training. He worked in six games in relief, three in April and three in May, accumulating a total of 2 1/3 innings. This time he had no decisions and a 3.86 ERA. He was optioned to Columbus on May 10 and spent the rest of the season there, going 14-9 (3.28). On October 2, the last-place Mets took a flyer on him and purchased him from the Pirates. Bill Short was one of 18 pitchers in spring training competing for 10 slots on the Mets.12 He made the team and spent the full 1968 season with the Mets, (the most time he’d spent with any one big-league team). Short took part in one notable game in his second appearance: on April 15 he closed out the 12th inning and started the 13th inning in a scoreless game against the Astros that ran 23 innings until the Astros won it on an error in the bottom of the 24th. Short appeared in 34 games but only for a total of 29 2/3 innings. He had no decisions, but earned one save and eight holds. His ERA for the year was 4.85. After the season, the Mets released him outright to their Jacksonville farm club. On December 2 he was drafted in the Rule 5 draft again, this time selected by the Cincinnati Reds. He spent most of 1969 playing in Indianapolis, the Reds’ Triple-A affiliate, save for four games in the first 13 days of June when he came up to Cincinnati. They were his last four games in the major leagues. He only faced 11 batters, over 2 1/3 innings, but gave up four earned runs. All four games in which he was used were losses, none attributed to him. He returned to Indianapolis. There, he was 12-7 (3.86). Thus ended his playing career. In January he was named minor-league pitching instructor by the Pittsburgh Pirates. In addition to the sources noted in this biography, the author also accessed Short’s player file and player questionnaire from the National Baseball Hall of Fame, the Encyclopedia of Minor League Baseball, Retrosheet.org, and Baseball-Reference.com. Thanks to Rod Nelson of SABR’s Scouts Committee. 3 John Drebinger, “Duren Nips Rally,” New York Times, April 24, 1960: S1. 4 Author interview with Bill Short on January 10, 2018. 5 See for instance, “Yankee Hope On A Rookie,” Chicago Defender, July 29, 1959: 23. Regarding the resemblance to Ford, Arthur Siegel of the Boston Traveler called him “almost a twin of Whitey Ford…Same coloring of hair and same rosy cheeks.” See “Yanks May Bring Up Short Hurler” in the June 11, 1949 Traveler, on page 4. A good article on Short’s development in the minors is Shelley Rolfe, “The Story Is Short,” Richmond Times Dispatch, May 20, 1959: 25. 6 Shelley Rolfe, “A New Angle to A Story,” Richmond Times Dispatch, August 25, 1959: 18. 7 “Yankee Rookie Wins in Major League Debut,” Chicago Tribune, April 24, 1960: D2. 8 Steve Snider, UPI, “Yankees’ Bill Short Start Mound Pupil of Ed Lopat,” Hartford Courant, May 10, 1960: 24. 9 Shelley Rolfe, “Birds Manager on Former Vee: ‘A Pure Gamble’,” Richmond Times Dispatch, May 8, 1962: 18. 10 Joe Cashman, “Sox Buy Pair, Cut Morehead,” Boston Record American, August 16, 1966: 48. 11 Vig Ziegei, “Long Wait Pays Off For Met Named Short,” New York Post, April 4, 1968: 88. See also Jack Lang, “14 Years of Roaming – Short Makes It With the Mets,” The Sporting News, April 20, 1968: 20. 12 Joseph Durso, “It’s Every Pitcher for Himself As 18 Hurlers Eye 10Mets Jobs,” New York Times, February 28, 1968: 54. 13 Author interview with Dorothy Short on January 20, 2018.